Biological production at marine ergoclines (L. Legendre et al.). Biological production at the ice-water ergocline (S. Demers et al.). Studying fronts as contact ecosystems (S. Frontier). The frontal zone in the southern Benguela current (L. Hutchings et al.). The dynamic control of biological activity in the southern Benguela upwelling region (G.B. Brundrit). Frontal zones, chlorophyll and primary production patterns in the surface waters of the southern ocean south of Cape Town (J.R.E. Lutjeharms et al.). Frontal systems in the German Bight and their physical and biological effects (G. Krause et al.). Role of thermal fronts on Georges Bank primary production (P. Klein). The role of streamers associated with mesoscale eddies in the transport of biological substances between slope and ocean waters (C.S. Yentsch, D.A. Phinney). On the dynamics of a tidal mixing front (G.J.F. Heijst). Zooplankton in the upwelling fronts off Pt. Conception, California (S.L. Smith et al.). Observations of finestructure formed in a continental shelf front (Southeastern Bering Sea) (L.K. Coachman). Some aspects of the Liguro-Provençal frontal ecohydrodynamics (J.H. Hecq et al.). Plankton distributions and processes in the Baltic boundary zones (M. Kahru et al.). The role of the loop current in the Gulf of Mexico fronts (D.A. Salas de Leon, M.A. Monreal Gomez). Preliminary study of a front in the Bay of Campeche, Mexico (S.P.R. Czitrom et al.). The interaction of physical and biological processes in a model of the vertical distribution of phytoplankton under stratification (A.H. Taylor et al.). Estimates of the nitrogen flux required for the maintenance of subsurface chlorophyll maxima on the Agulhas Bank (R.A. Carter et al.). Modelling the time dependent photoadaptation of phytoplankton to fluctuating light (K.L. Denman, J. Marra). The effects of the broad spectrum of physical activity on the biological processes in the Chesapeake Bay (A. Brandt et al.). Aspects of the northern Bering Sea hydrodynamics (J.C.J. Nihoul). Simulation analysis of plankton dynamics in the northern Bering Sea (J.J. Walsh, D.A. Dieterle). The terrestrial-marine interface: modelling nitrogen transformations during its transfer through the Scheldt River system and its estuarine zone (G. Billen et al.). Mobilization of major and trace elements at the water-sediment interface in the Belgian Coastal area and the Scheldt estuary (W. Baeyens et al.). Seasonal nutrient supply to coastal waters (L. Rydberg, J. Sundberg). Larval settlement of soft-sediment invertebrates: some predictions based on an analysis of near-bottom velocity profiles (C.A. Butman). Turbidity and cohesive sediment dynamics (E. Patheniades). ADRIA 84: a joint remote sensing experiment (P. Schlittenhardt). Identification of hydrographic fronts by airborne lidar measurements of Gelbstoff distributions (D. Diebel-Langohr et al.). Water depth resolved determination of hydrographic parameters from airborne lidar measurements (D. Diebel-Langohr et al.). A quantitative description of the chlorophyll a fluorescence reduction due to global irradiation in the surface layer (K.P. Günther). Nimbus-7 coastal zone color scanner pictures of phytoplankton growth on an upwelling front in Senegal (C. Dupouy et al.). Mangrove ecosystem study of Chakoria sunderbans at Chittagong with special emphasis on shrimp ponds by remote sensing techniques (O. Quader et al.). Biological processes associated with the pynocline and surface fronts in the Southeastern Bering Sea (T.E. Whitledge, J.J. Walsh). These proceedings describe physical and biological observations (including remote sensing observations) made at such diverse marine ergoclines as pynoclines, fronts, water-sediment and water-ice interfaces in different locations and environmental conditions. 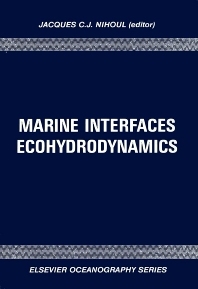 Mathematical models are described which are used to investigate the phenomena, providing a common language for their interpretation and the bases of the ecohydrodynamic study of marine interfaces.